Our good ol’ pal Nicol Bolas is back and ready to rock Naktamun. He has ravaged everything on its way. Fire, death, horns: he has had his time, his damned Hour of Devastation. Now, standing on the smoking ruins of this destruction, it’s our turn to analyze the Card of the Month, an enchantment that has already provided a bunch of questions for this edition: Solemnity. From the outside things like “players can’t get counters” or “counter can’t be put on…” may seem simple, but nothing is too intuitive with Magic. Forgotten spells lie awaiting their time, and the smallest distraction when creating a new card may unleash some unexpected interactions. Let’s take a look at them. What do you mean with “Players can’t get counters”? As of now, there are three different counters that may be put on a player: poison (Blighted Agent), energy (Aether Hub), and experience (Daxos the Returned). This Solemnity forbids this very action: putting counters on players, but doesn’t affect the existing ones. This way, for example, if a player has eight poison counters and plays a Solemnity they won’t get more counters while the enchantment sticks around, but will keep those eight counters. The same is true for energy and experience counters. What do you mean with “Counters can’t be put on artifacts, creatures, enchantments, or lands? If a cost asks you to put a counter on one of these permanents you won’t be able to. This means that you won’t be able to pay that cost, and thus you won’t be able to cast that spell or activate that ability. This means you can’t cast Lethal Sting. Imagine that player A has a Solemnity on the battlefield and a Szadek, Lord of Secrets. When Szadek deals damage, he has a replacement effect that replaces that damage with +1/+1 counters that will go on him and mills the same number of cards from the defendant’s player library. In this case, no counters will be placed on Szadek, but that won’t prevent the milling from happening. Of course, no one will lose life because of that damage, since that damage has been replaced. Let’s suppose that player A has Solemnity on the battlefield and a Soul-Scar Mage. He casts Magma Spray targeting an opponent’s creature. While resolving the spell the replacement effect from the Mage kicks in and would put that same number of -1/-1 counters on the creature instead. But, due to Solemnity doing its thing, the replacement effect won’t be able to do anything because no counters can be placed on the creature, so the original event does not happen. And so, the spell neither deals damage nor puts counters. As a last caveat, let’s take a look at a small detail: If an artifact, creature, enchantment, or land would enter the battlefield with counters on it at the same time a Solemnity is entering the battlefield, that card will enter with those counters. On the other hand, if a Solemnity already was on the battlefield, the card will enter with no counters, as expected. Now that we’re briefed on how our Card of the Month works, let’s look some additional rules and definitions. The Comprehensive Rules tell us that a counter is a marker put on an object or player that modifies its characteristics and/or interacts with a rule, ability, or effect. Ice counters, from Dark Depths. If we play this land with a Solemnity in play it will enter without counters, and that means that we will need to sacrifice it as soon as it hits the board thus bringing our good ol’ friend Marit Lage to the party. Oh, well, that’s … unfortunate? Flood counters, from Bounty of the Luxa. With this card and Solemnity in play, once we remove all flood counters (if any) we won’t be able to put more on it, meaning that we’re going to draw a card each turn. Loyalty counters, associated with Planeswalkers are so far unaffected by Solemnity. So far. Time counters, usually associated with cards with Suspend or Vanishing. These abilities, and thus their time counters, are influenced differently by Solemnity. Suspend puts time counters on a card with “Suspend N” that we have previously exiled, so it’s not affected by our enchantment since the card would be in the exile zone and not on the battlefield. We simply have to wait the required turns to cast the Suspended card. Vanishing, on the other hand, it’s greatly affected. Cards with “Vanishing N” enter the battlefield with time counters on them, and at the beginning of each upkeep one of them is removed until there are no more time counters on the card. In this case, Solemnity will make the card enter with 0 counters. This way, at the beginning of the next upkeep, the ability that makes us remove counters will never trigger, so we will never have to sacrifice our permanent. Charge counters, used in many editions, are used on Chalice of the Void and Engineered Explosives. In these two cases, and no matter how much we have paid to cast them, they will enter the battlefield without counters. So, unless we really want to counter an Ancestral Vision or destroy all tokens in play, they’re not going to do much else. Storage counters, used on lands like Dreadship Reef, Calciform Pools, Mage-Ring Network, or Crucible of the Spirit Dragon. They all work the same: we store mana using these counters and then we remove them later to generate as much mana as counters we had. With Solemnity in play, these lands can’t “charge” up, but they will still generate mana with existing counters or colorless (if able). Age counters, usually used with Cumulative Upkeep. Age counters keep track of how many turns the permanents have been on the battlefield. With Solemnity in play those counters are not going to be put on anywhere, so the cumulative upkeep won’t go up. A somewhat powerful interaction. 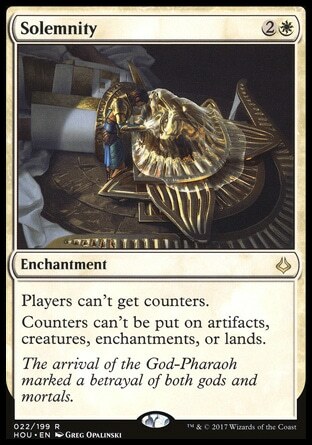 Now that we know about the counters, and before Nicol Bolas comes back, let’s see some interesting interactions with Solemnity and other cards. Hope this helps settle any discussion that may happen. Walking Ballista, possibly one of the most played cards in the past months in Standard as well as in Modern. An artifact creature that enters the battlefield with X +1/+1 counters while Solemnity is on the battlefield will enter with 0 counters, no matter how much mana we use to cast it. Upon entering the battlefield, it will go directly to the graveyard as a state-based action. If it was on the battlefield already with some counters we’ll be able to remove them to deal damage with the last ability, but paying 4 colorless mana to add more counters will do nothing. Use the mana for some other, more useful, things. Thing in the Ice, another much played creature in control-based decks, enters the battlefield with four ice counters on it. If Solemnity is in play no counters will be put on it, but this doesn’t mean the ability will immediately trigger: we’ll still need to cast an instant or sorcery spell to trigger it and transform the horror. Consuming Fervor, somewhat less present in constructed and more in limited, is now a bit more interesting thanks to Solemnity. The enchanted creature dies little by little on each of our upkeeps, but thanks to our Card of the Month, no -1/-1 counters will be put on it so it will stick around. Something very similar happens with Ammit Eternal and Magmaroth, two forgotten cards that may now have new life on them. Bristling Hydra becomes way worse with Solemnity, no questions asked. On one side, players won’t get energy counters, and on the other, even if we pay EEE to activate its ability, we won’t put any +1/+1 counters on it. But beware, even if no counters are put on the Hydra it will still gain hexproof. It won’t get bigger, but it’s still tough to kill. And now that I see some horns over the horizon it may be a good time to start closing this article. To make it even more complicated, let’s see the interaction of the interactions, the weirdest and more fun than useful: Mycosynth Lattice. This artifact, with its first ability, generates a continuous effect that makes every other permanent an artifact in addition to their other types. So far, so good. But if we combine this in the battlefield by a Solemnity then every permanent is affected by its effect. Every. Single. One. Now even Planeswalkers, that managed to avoid it, are being affected by it. So, in this example, if we play a Gideon, Ally of Zendikar and combine it with Mycosynth Lattice and Solemnity it will enter the battlefield with its usual loyalty counters, because Solemnity does not see it as an artifact at the time the counters are put on it. What we can’t do once the planeswalker hits the board is activating its plus abilities, but being unable to put counters on it doesn’t mean we’re unable to remove them. We’ll be able to activate all abilities that remove them or don’t change their number, but we’ll be unable to activate the ones that add them. In short, even though Gideon manages to survive a Solemnity, if the Mycosynth is in play it will probably not live much longer. And that’s all for our Card of the Month. Maybe Nicol Bolas managed to destroy Naktamun, but I’m awaiting him with a Solemnity in store and ready to rock.